Welcome to the Syracuse University Flow Cytometry and Cell Sorting Core Facility! 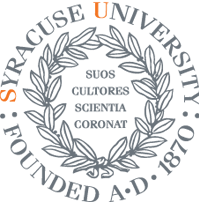 This shared resource facility is open to all researchers in the Syracuse area and is now accepting samples for analysis. Flow cytometry in the facility is supported by the BD Accuri C6 flow cytometer. Click here to learn more about this instrument. Cell sorting in the facility is supported by the BD FACSAria II cell sorter. The sorter is contained in a dedicated Baker BioProtect negative pressure biosafety hood. Click here to learn more about this instrument. Both instruments are capable of processing samples of up to and including those designated biosafety level II. Flow cytometry and cell sorting is facilitated by a full-time, dedicated operator available from 9:00am-5:30pm, Monday through Friday. We are happy to meet with you to discuss flow cytometry/cell sorting, experimental design, and any other questions or concerns you might have regarding use of the facility. Please feel free to contact the operator for more information or to set up a meeting! Click the links above to learn more about instruments, reserve time in the facility, contact the flow core staff, and more.